It has taken something in the realm of a year and a half of negotiation, but at long last the AFL has finally locked in a new Collective Bargaining Agreement to cover seasons 2017-2022. The immediate effect of the new CBA is a significant pay rise for AFL players, with the 2017 salary cap to be a 20 per cent increase on the 2016 level. That will see the 2017 salary cap rise to a total of $12.45 million per club, or $224 million across the competiton as a whole. The average player wage will increase from $309,000 to $371,000 as a result, and it will rise to $389,000 by 2022. Players who have the “uplift clause” in their current contracts will automatically see their wages increased in line with this overall salary cap rise. The increase means that any player currently earning around $840,000 with the uplift clause in their contract will shoot up into the million-dollar club, which will likely contain 20 or so players now. It was suggested at the AFL’s press conference that “roughly half” of all players have the uplift clause in their contract. In addition to that, first-and-second-year players, whose wages are standardised by the AFL, will no doubt also see an automatic increase in their earnings. The minimum wage for a first-round draft pick in 2017 will be set at $88,193. Rookie-listed players will also have increased wages – more on that later. Any clubs that, after these increases, are not meeting the minimum requirement that they pay at least 95 per cent of the salary cap, will be required to restructure existing contracts in order to meet that minimum benchmark. In addition to this immediate increase, the cap will steadily increase throughout the course of the time governed by the new CBA. The cap will increase a further 1.2 per cent in 2018, 1.3 per cent in 2019, and then two per cent every year from 2020 to 2022. The minimum total value of the new CBA across six years will be $1.84 billion. The AFL will provide the cost of all player salaries to clubs. In a larger sense, the players’ income will for the first time be tied to the profits made by the league and clubs. 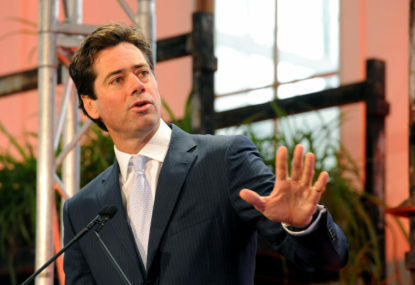 The base agreement of the new CBA will see players receive 28 percent of forecast-defined football revenue, but a review mechanism will be put in place should the AFL and clubs record additional revenue. In that case, the players will receive 28 per cent of any additional AFL revenue and 11.2 per cent of addition club revenue above forecasts. Some revenue including bequests and donations, government grants, non-football revenues and AFLW revenue will be excluded from this mechanism, as will any revenue generated by the AFL through it’s ownership of Etihad Stadium, with that revenue to be used to repay the AFL’s loan on the stadium. Any additional revenue gathered by this review mechanism will be paid to the player’s retirement accounts, in 2019 and 2022. Click here for an AFLPA infographic on the new payment structure. There will be a change to free agency of some kind, however, it hasn’t yet been confirmed what the change will be. It will be one of the following three possibilites, and it will be brought into effect before the commencement of this year’s free agency period. Free agency for life – once they have qualified for free agency at least once, a player will qualify for free agency any time they are out of contract in the future, even if they have already moved clubs through trade or free agency within the last eight years. Free agency portablity – any player who has been in the AFL for at least eight years and is out of contract will qualify for free agency, even if they have played with more than one club during that time period. Four-year free agency – any player who has been at a club for at least four years but is not being paid the median AFL wage or above will qualify for restricted free agency. The AFL has confirmed that it will bring at least one of these changes into affect between now and the beginning of the free agency period, and will liase with the clubs to decide which. It is considered most likely that it will be one of the first two, and not four-year free agency. For more discussion of the potential free agency changes, read my thoughts on them published last month. It has also been confirmed that a player will now be eligible to become an unrestricted free agent after ten years service even if they have not entered into a new contract in the last two years, which was previously prohibited. Some significant changes have also been made to how the rookie list will function, and the wages that rookie-listed players will receive. The rookie list minimum wage will now increase to $71,500 per year, and Category-A listed rookie players (those taken in the rookie draft) will be eligible to play senior football in 2018 without needing to wait for an elevation to the senior list. Clubs will still be required to list 4-6 Category A rookies, to make a total of 44 combined with the required 38-40 senior listed players. They will also be allowed to list as many as three Category B rookies (rookies signed internationally, from another sport, or through other unique circumstances), but are not required to have any if they do not wish to. The AFL and AFLPA will also jointly establish a Lifetime Health Care and Career Ending Injury fund, with an annual $4 million contribution from the AFL, to benefit players after their careers end. The AFL will also invest $13 million into player development programs and services, and will make an annual $250,000 contribution towards concussion research, inclusive of all tribunal fines. The AFL will provide 12 business class tickets per flight for WA-based teams completing travel to the east coast, and will provide business or premium economy tickets for any international flights to destinations other than New Zealand. Accomodation costs will no longer be included inside clubs’ soft caps, and there will no longer be a provision allowing for players to contribute to the cost of pre-season camps. Players who are rested from games or held over as travelling emergencies will also now be given a full match payment as if they had played. AFL players will also now have greater access to grand final tickets, including eight tickets provided for each competing player. Click here for an AFLPA inforgraphic on the non-financial elements of the new CBA. In a win for the fans, the AFLPA has agreed to sign over the use of selected GPS data to enhance broadcast coverage of the game. One flow-on effect of the new deal will be a likely slew of re-signings over the next few weeks, as clubs and players across the competition have put new deals on hold until they have a clear view of what lies ahead. Brodie Grundy and Jake Lever in particular are young stars out of contract who have publicly said they would wait for a new CBA to re-sign, so it will be interesting to see whether or not they follow through. In addition to them, it will also be intriguing to see if prominent free agents Nat Fyfe or Dustin Martin opt to re-sign with their clubs in the wake of the new CBA. If they do opt to leave at the end of this season, it is possible that an expanded salary cap could lead to one of them becoming the highest-paid player in the history of the competition. It will also mean that clubs have something of a larger ‘warchest’ with which to go hunting this off-season, which could turn October into a month of carnage. Those clubs that have not included uplift clauses in their player contracts will only have to restructure up towards paying a total of 95 per cent of the salary cap, and so could have a bonus $600,000 or so to splash around. If they do that largely by front-loading longer term contracts to be paid this year, then they may find themselves with enormous amounts of salary cap space available to spend on new recruits. Clubs that are moving a few senior players on at the end of the year will find they have a lot of spare dollars to spend – at first glance, Essendon and Hawthorn jump out as big spenders. The same will go for any clubs that have one or more big name players poached, with Richmond and Fremantle possible examples, and also perhaps GWS. It may not happen all at once but with the rate of player movement breaking new records each year, free agency getting at least a little looser, and clubs having more dosh to throw around, expect to see a real spendapalooza certainly over the next two off-seaons, and into the future. The AFL players are getting a pay rise, and quite a nifty one. The average AFL player will get about an extra $70,000 or $80,000 a year. The players are also getting a bunch of nice things from the AFL and there will be more of an effort made to support players after their careers. The AFL may or may not decide to completely blow up free agency, but will most likely only make changes that will be barely noticeable. You can expect to hear BT, Lingy, Richo and Darce bore you to tears with the details of player GPS data in the near future. Caveat: some of it may actually be interesting. Lastly, it’s going to be another big, crazy, fun October.